On May 20th, our dealership once again hosted “Battle of the Potjie Kings”. This competition sees various pre-selected teams scraping every ounce of creativity and cooking skills together to make the best potjiekos in Cape Town. This year saw the winners for 2016, the Harley-Davidson® Club of Cape Town, put their best foot forward to defend their title! We opened our doors at 7am for the very enthusiastic teams to start setting up – as any South African would know – making the perfect potjie is a serious matter! From a cowboy theme embellished with hay bundles, homemade wines to compliment, bread baked on the fire and much more, competitors went all out to impress our fabulous guest judges. Thank you very much to singer/ comedian and all-round fabulous T.V personality Wicus van der Merwe. 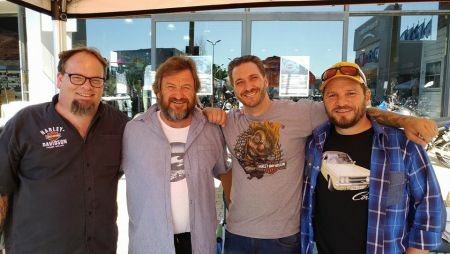 SA acting veteran, respected celebrity and nature lover Albert Maritz as well as owner/ editor of SA Hotrod Magazine and petrol head Joe van Zyl for taking the time to sample every delicious potjie and give us their honest opinion (we know that it must have been a tough job)! And last but not least, this year’s Potjie Kings: H.O.G.®Breede River Chapter! A special mention to the SOGS who won “Best Team Spirit”! Thank you to everyone that joined us for the day. We look forward to next year’s ‘Battle of the Potjie Kings” and hope that you’ll join in the fun!